The Audio Options inspector lets you change parameters of selected audio in the Storyboard/Timeline. You can make changes to multiple audio items at once by selecting several items in the Storyboard/Timeline before adjusting settings in the Audio Options inspector. The Audio Options inspector opens automatically when you double-click and audio item in the Storyboard/Timeline. When a single audio item is selected, the filename of the audio file will be displayed here. If you want to replace the audio file, while keeping all other parameters (volume, fades, audio markers, etc), select the Replace Media File... command from the popup menu next to the filename. You can also select Get Info to show info about the audio file. When you replace an audio file of an audio item that contains audio markers, you probably have to redo all audio markers, as the old markers most likely do not match the beat of a different song. Controls how loud the audio is playing. Adjusting the volume is useful when different songs have been recorded at different levels and do not playback with similar loudness. Click and drag the Volume slider or enter a numerical value in the text field next to the slider. You can also interactively adjust the volume directly in the Timeline. Click and drag the horizontal part of the yellow volume envelope line and drag up and down to increase or decrease the volume. When Ducking is enabled, the volume of other audio tracks is lowered by the specified percentage while this audio item is playing. This may be useful to lower the volume of music, while a sound effect or narration is playing. The default ducking factor is 50%, but you can enter a different percentage. Specifying a ducking factor of 100% means that other audio tracks are completely muted while this audio item is playing. Using a ducking factor around 70% is useful for narration. That way, music is lowered enough so that the narrator can be heard clearly. Normally audio is automatically faded in at the beginning and faded out at the end. The duration of these automatic fades is dependent on the visual transition between those slides. 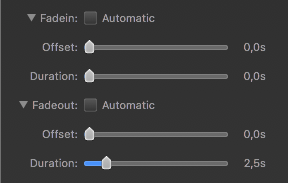 Please refer to the table in the Transition Options section to find out how the choice of transitions affect the automatic audio fades. 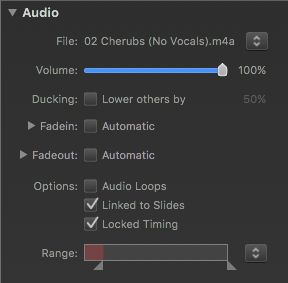 Audio fades can also be customized, if you turn off the Automatic checkbox. In this case the Offset and Duration sliders will be enabled. Offset determines the start of a fade-in or fade-out (from the beginning of a slide), while Duration determines the length of the fade itself. You can also set custom fade-ins or fade-outs by clicking and dragging in the Timeline. Drag the left edge of an audio item to adjust the fade-in offset. Drag the small square yellow dot at the end of the fade-in triangle to adjust the fade-in duration. Drag the small square yellow dot at the end of the fade-out triangle to adjust the fade-out duration. Drag the right edge of an audio item to adjust the fade-out offset. Note that an audio item must be selected, or the yellow volume envelope, the fade-in and fade-out triangles will not be visible. Some combinations of slide duration, fade offset, and fade duration are not possible. As you drag offset or duration, the other value may be adjusted automatically to make sure that only valid combinations are used. If the audio is not long enough for the slides it spans, then checking Audio Loops makes sure that the audio is repeated while those slides are visible. This may be useful for interactive presentations when you don't know how long it will take to present a sequence of slides. It may not be appropriate for narration or music that has been carefully synced to the slides with audio markers. Audio can behave in two different ways when slides are being rearranged. The audio can either stay where it is, or it can move along with the slides that are being rearranged. This behavior can be decided for each audio item separately and can be controlled by selecting the Linked to Slides checkbox or by using the command Linked to Slides in the context menu of the audio item. The Authoring pane in the Preferences window has a section that lets you select whether newly added audio should be linked, unlinked, or whether FotoMagico should choose intelligently (depending on the situation). In this third case, audio will be linked if dropped below existing slides in the Music or Narration tracks, or unlinked if dropped into an empty section of the Storyboard. You may want to link audio to slides when you have completed a chapter in your slideshow with carefully synced audio. If you then add or delete slides before that chapter, the audio moves along with the slides and everything stays in sync. In other cases, you may elect to not link the audio. This may be the case for background (ambient) sound where exact synchronization is not needed, or while you are still working on a chapter. Unlinked audio always stays in the same spot, regardless of how the slides above it are being rearranged. When Locked Timing is enabled audio is paused when the slideshow is paused. Audio also jumps to the appropriate position if the slideshow jumps back to the previous slide or skips ahead to the next slide. In other words, with locked timing, audio always stays in sync with the visuals. This is especially useful for those parts of the slideshow that have been carefully synced with the audio - e.g. for music that contains audio markers, or recorded narration. It may not be appropriate for sound effects that merely provide an ambience for a slide. Set in and out points to restrict the portion of the audio to be played. This is done by dragging the triangles inward. Only the portion between the triangles will be played. The red section will not be playerd. The audio file itself will not be modified, so all changes can be undone at any time. The audio waveform in the Timeline adjusts automatically as you make changes. For more precise control over in and out points, you can enter an exact in point or out point. From the popup menu, select Finetune In Point or Finetune Out Point or double-click on the in point or out point triangles to open a popover to enter an exact timecode or use the jog wheel. In the Timeline, you can also press the ⌥ key while clicking and dragging in the waveform to adjust the in point. This is helpful when there is silence at the beginning of an audio file and you want to skip over the silence.